Stock #4107, Retail Price $29.95. To buy a copy now, click here. New Game Value: Fifteen new ships for five different empires, eight new scenarios including the Energy Monster. Hydran Attack also REQUIRES Distant Kingdoms for use. 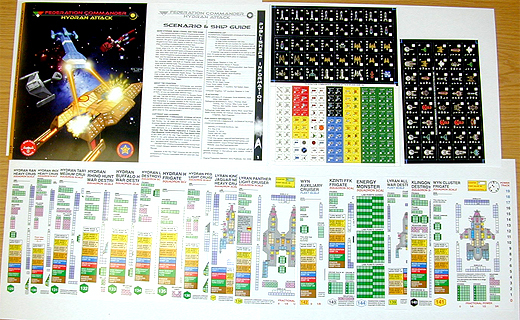 Components: Sixteen-page Ship & Scenario guide, 140 half-inch and 80 one-inch full-color die-cut playing pieces, sixteen full-color double-sided laminated ship cards. Hydran: 129-Ranger, 130-Iroquois, 131-Tartar, 132-DWH, 133-DWF, 134-Lancer, 135-Hunter, 136-Pegasus. Squadron Boxes #25, #26, and #27 provide one each of the pewter scale miniatures to match the Ship Cards in this product. Stock #s 4325, 4326, 4327; Retail $34.95. These packs will be available in November (#25 and #26) and February 2010 (#27). Boosters #25, #26, and #27 provide additional copies of the most often used ship cards so you can fly multi-ship squadrons, and entirely new Ship Cards. Stock #s 4225, 4226, 4227; $9.95. 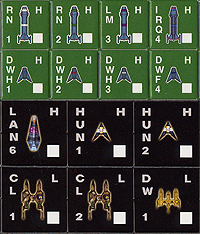 Border Box #9 provides 24 miniatures to match the ships inBoosters #25, #26, and #27. Stock number 4409; retail $99.95. To buy any of these products now, click here. Romulan Border or Klingon Border or Academy include all required rules for the ships in this product. This product requires one of those products.